Countless readers have been helped by the famous “Babylonian parables,” hailed as the greatest of all inspirational works Beloved by millions, this timeless classic holds the key to all you desire and everything you wish to accomplish. This is the book that reveals the secret to personal wealth. To ask other readers questions about The Richest Man in Babylon, please sign up. please how do i read this book online? I have heard about this book but have never read it. Is it really that good? I could never get a pass the title. Richard & Madeleine Knill I first read this book about 30 years ago and have just re read it. It is as relevant now as it was then. Very very clear what you have to do. Despite George Clason's (the author) best, somewhat self serving, intentions America has clever and deeper pocketed interests such as Capital One Master Card, Retailers, Payday Loan Centers, and the Brick and Mortar of the American Economy, Capitalism and Consumerism that are determined in showing us that being broke and having things is better than being the Richest man in Babylon and suffering our old acquaintances showing up at high school reunions in fancier cars than our mid 90's Toyota 4Runner. For those that find Richest Man in Babylon persuasive, putting forward novel concepts that will motivate them to straighten out their finances, I've got bad news. The hounds of consumerism will put out an equally persuasive message which will financially pull in the other direction and it will be back to potentially suffering from Aflatoxin poisoning while eating dry cat food to knock out this month's rent. فيصبح لها قيمة ومعنى . فحينها ينظر البعض إلى رغبته تلك على أنها خيالية! أو يمكن تحقيقها فقط بأن يتحول إلى لص، أو أن تهبط عليه ثروة من السماء ! وكأن طرق الثراء الحلال انقطعت أسبابها ! لتحوّل العقل الاستهلاكيّ إلى عقل استثماري ..
خطوة خطوة عن طريق خطة عمل اهتم المؤلف بجميع تفاصيلها من محفزات أو معوقات ..
حيث اختلط فيه الحابل بالنابل ..
لأن المؤلف غير مسلم لم يأبه باختلاط المعاملات المالية من قرض ،رهن ، شراكة. أما الإسلام فيفصل بين هذه المعاملات؛ إذ لكل منها طريقة وحكم . This was an unusual but engaging multi-layered tale about finance, business and human accomplishments that, I admit, could have been less simplistic but that was smart enough to make me think about my own financial situation and offered advice worth considering. This book was absolutely fantastic! It really opened my eyes to finances and has changed the way I view them. One of the biggest things this book teaches is that no matter what size your income is, 10% of it is yours to keep. Another is that debt is an enemy to conquer, not a necessary evil. One of the families in the story did this, and had to pay rent on top of it. We have long realized that renting and paying interest on a mortgage is about the same. Michael and I came up with a spending plan This book was absolutely fantastic! It really opened my eyes to finances and has changed the way I view them. One of the biggest things this book teaches is that no matter what size your income is, 10% of it is yours to keep. Another is that debt is an enemy to conquer, not a necessary evil. One of the families in the story did this, and had to pay rent on top of it. We have long realized that renting and paying interest on a mortgage is about the same. Michael and I came up with a spending plan that allots 20% of our income to actually paying off our debt, and we will be completely debt free in 9 years, and in that time we will also have allotted 10% to savings. 10% of our income goes to tithing as well, so this gives us 60% of our income to live off of. But we took that figure and created a plan based on that amount. We're not going to starve on that figure. الكتاب لا يوجد به صور ومترجم للعربية ولا زلت لا ارى سبب يدعو لوضع هذا الشعار ان كان مقصودا الا اذا كان وضعه غير مقصود فلماذا هذا الشعار بالذات ! My brother passed me this book many years ago. His instructions were simple: Read it. It'll change your life. I read it. Did it change my life? Yes, in a manner of speaking. 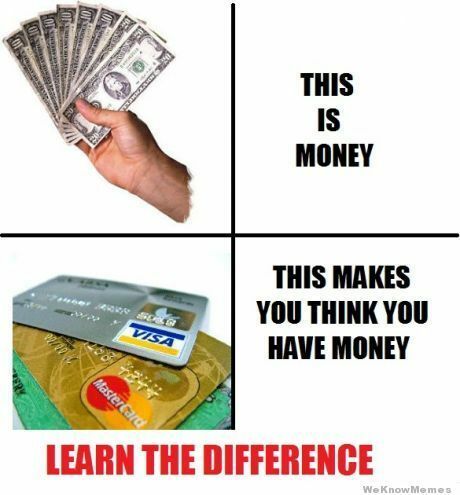 There are many of out there who desperately want to learn the basics of handling money. But, pick up the latest drudgery from your local bookstore on the subject, and you'll find yourself wading through terms and calculations that may as well be a foreign language. The Richest Man in Babylon takes a different approach. It puts My brother passed me this book many years ago. His instructions were simple: Read it. It'll change your life. 3. Don't put all of your eggs in a single basket (Diversify your portfolio). ابتسامة علقت على صغري حينما انتهيت من قراءة الكتاب، هذا النوع من الكتب، هو كتاب يجعلك تشعر بالفخر لأنك قرأته، لأنك قرأته حتى النهاية وحينما تصل للنهاية تصدم من كم الفائدة الذي حصلت عليه من خلال هذا الكتاب. قبل التحدث عن الكتاب دعوني أخبركم عن سبب قراءتي له، أنا مبذرة وحينما أستخدم هذه الكلمة أعنيها، جميع الأموال التي أحصل عليها من عملي ومن مصروفي الخاص يذهب دون رجعة، وفي ماذا ؟ في أشياء سخيفة وليست مفيدة، وعلى الرغم من هذا أعترف بذنبي وأشعر أنه يجب أن يكون لي مال مدخر، ولو قليلًا من أجل المستقبل، ومن أجل حالات الطوارئ والأزمات، يجب أن أتعلم الإعتماد على نفسي وأن أشكر نعمة الله علي بعدم الإسراف في ما يأتيني من مال، فحينما تنتهي السنة وأقوم بحساب ما كسبته من مجالات عملي أصدم بالمبلغ الذي ذهب خلال سنة دون أن أشعر أني حقًا إستفدت مما كسبت، حدثت الكثير عن رغبتي بالإدخار عبر تويتر، وبالفعل نصحني أحد الأصدقاء بهذا الكتاب وكان يصر كثيرًا علي من أجل قراءته وأنا ممتنة له ومدينة كونه عرفني على هذا الكتاب. الكتاب يأتي بغلاف أنيق من الحجم الصغير عدد صفحاته 151 صفحة، ليس كثيرًا كما تتوقعون، كما يأتي مقسمًا لأحد عشر فصلًا في قالب قصصي ممتع عن بابل القديمة، وكيف أصبحت بابل من أغنى دول العالم في ذلك الوقت . الكتاب يقدم نصائح مالية وإستثمارية، واستشارات في مجال المال ليس بأسلوب كاتب اقتصادي ممل، بل بأسلوب روائي قصصي، فيه الكثير من المتعة وأخبار القدماء، وهو مبني حقيقة على قصص ظهرت في ألواح صلصالية من عهد بابل القديمة، حتى أن القارئ لا يشعر بالملل وهو يقرأ الكتاب، بل ستنتهي من كل فصل وتذهب للآخر، حتى تنتهي منه ربما خلال ساعة ونصف. يقدم لك هذا الكتاب الطريق نحو ما ترغبه وكل ما تتمنى أن تحققه. إنه الكتاب الذي يكشف سر تحقيق الثروة الشخصية. كتاب رائع يتحدث لك عن رجال بابل وعلى وجه الخصوص أركاد أغنى رجل في بابل . وكيف إستطاع أن يتخلص من الفقر والعوز ويستغل الفرص التى سمحت له وأصبح من خلالها أغنى رجل في بابل . وكيف علم أصدقاءه ورجالات بابل وأنتشلهم من حالة الفقر والعوز الى الثراء الفاحش . ١. إبدأ في ملىء محفظتك . يعلمك ان قوانين المال واحدة لاتتغير مثلها مثل شروق الشمس كل صباح . او مثل الجاذبية الارضية والتى لم تتغير على مر العصور . أو إنفاقه على كمالياته أو أمنياته..
أيضًا في الكتاب دعوة للإنفاق في وجوه الخير والإحسان..
مجموعة من الحكايات توضح للقارئ أسس التعامل مع المال, وتركز على أهمية الادخار, والتقليل في النفقات, واستثمار العائد في مشاريع مربحة ذكية, لتتحقق سعادة الفرد بازدياد ثروته. في معظم الصفحات كانت "بابت" لسنكلير لويس حاضرة في ذهني, فمع أن الكتابين نُشرا في نفس الفترة تقريبًا ( هذا الكتاب في 1926, و "بابت" 1922 ) وكلا الكاتبين من أمريكا, إلا أن المحتوى مختلف جدًا, فهنا تمجيد للثراء واعتباره السبب الرئيسي للسعادة والراحة, وعند لويس يمكن اعتباره من أهم مسببات عدم الاستقرار الداخلي أو الذاتي, وما بين هذ مجموعة من الحكايات توضح للقارئ أسس التعامل مع المال, وتركز على أهمية الادخار, والتقليل في النفقات, واستثمار العائد في مشاريع مربحة ذكية, لتتحقق سعادة الفرد بازدياد ثروته. في معظم الصفحات كانت "بابت" لسنكلير لويس حاضرة في ذهني, فمع أن الكتابين نُشرا في نفس الفترة تقريبًا ( هذا الكتاب في 1926, و "بابت" 1922 ) وكلا الكاتبين من أمريكا, إلا أن المحتوى مختلف جدًا, فهنا تمجيد للثراء واعتباره السبب الرئيسي للسعادة والراحة, وعند لويس يمكن اعتباره من أهم مسببات عدم الاستقرار الداخلي أو الذاتي, وما بين هذا وذاك يحاول القارئ أن يتوزان بين الآراء المختلفة. ليس بالكتاب السيء, فأفكاره وحِكمِه كانت ذكية, و نظرًا لأسلوبه البسيط, فقد تكون قراءته برفقة الأطفال أمر جيد ولطيف, ليتعلموا تلك الأسس من عمر مبكر. This is a great starting item for someone who is pressed for time and doesn't want to read a ton of financial books. While some of the ideas are archaically written, they remain timeless. An obvious one: as a person's wealth rises, so do their expenses. Translation, if you want to have money, learn to discipline yourself now and not later. Studies show that most lottery winners are bankrupt within a few years and mostly because they lacked self discipline. Therefore, the problem is not the lack o This is a great starting item for someone who is pressed for time and doesn't want to read a ton of financial books. While some of the ideas are archaically written, they remain timeless. An obvious one: as a person's wealth rises, so do their expenses. Translation, if you want to have money, learn to discipline yourself now and not later. Studies show that most lottery winners are bankrupt within a few years and mostly because they lacked self discipline. Therefore, the problem is not the lack of money but how it is managed. Any accountant worth his salt will tell you that. "...I made a million,today. What did you do?..." Have you heard about The Richest Man in Babylon, by George S. Clason first published in 1926, it’s a story that maybe you should read? When I first read this story I was just a young boy, but it still fascinates me now. My grandfather had given a copy to me to read, and after I finished reading it, I can remember him asking me what I had learnt. I can also remember what I said in reply "...I made a million,today. What did you do?..." My grandfather had given a copy to me to read, and after I finished reading it, I can remember him asking me what I had learnt. I can also remember what I said in reply. I explained to my granddad that I understood the wisdom of saving and how Armad the richest man in Babylon acquired his wealth that had spent much of his time teaching others how to become wiser, and I guess wealthier? You might consider that Arkad was lucky in his life that he was able to accumulate such wealth, but you would be wrong in your thinking. He had a simple philosophy save ten per cent of what you earn and invest, and this is what he did. Every day he taught to the crowd who would gather to listen that his fortune didn’t depend on lady luck, but on wise investment of one’s earnings. Those bankers which lost billions for their banks recently and had to be bailed out by governments around the world they should read the story about Arkad, but I guess they would be too busy spending their bonuses. I find it difficult to multi-task as well. Even computers cannot multi-task it just appears so. Anyhow, my grandfather said you need to read it again, because you have missed the most important point. This is what I did. Essentially, it’s easy to miss the opportunities that come our way which is the moral of the story. It wasn’t until I understood the importance of critical thinking that I really appreciated the truth in this book. When we make assumptions, we often make the wrong ones. أغنى رجل في بابل طرق وخطوات تعلمك كيف يمكنك أن تجمع المال وتصبح ثريا وكيف تحافظ عليه. 1- إبدأ في ملء محفظتك. 3- اعمل على انماء ثروتك. 4- حافظ على ثروتك من الضياع. 5- اجعل منزلك استثمارا مربحا. 6- اضمن دخلا ثابتا في المستقبل. 7- زد من قدرتك على الكسب. This review has been hidden because it contains spoilers. To view it, click here. The Richest Man in Babylon is a fantastic book to change your wealth paradigm. Originally published in 1926 as a series of booklets, the chapters are a little disjointed, but well worth the read. Clason espouses some very simple wealth building principles. First, save 10% for yourself. Secondly, invest 10% with the advice of knowledgeable and prudent advisers. Finally, he recommends using 20% of your income monthly as payments to get out of any debt you may have. 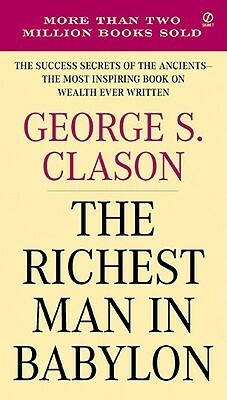 Clason recommends distributing t The Richest Man in Babylon is a fantastic book to change your wealth paradigm. Originally published in 1926 as a series of booklets, the chapters are a little disjointed, but well worth the read. Clason espouses some very simple wealth building principles. First, save 10% for yourself. Secondly, invest 10% with the advice of knowledgeable and prudent advisers. Finally, he recommends using 20% of your income monthly as payments to get out of any debt you may have. Clason recommends distributing this debt payoff amount evenly between all outstanding debts, thus paying them simultaneously. The remaining 60% can be used for living expenses. He encourages thrift and fortitude to lift oneself to wealth and warns against gaining wealth quickly. This book is applicable today when so much of the nation is in debt and living from one paycheck to the next. Many delightfully told stories of lifting oneself from poverty and dishonor to hard-won wealth sympathize with our situation and encourage diligent effort. كتاب رائع .. أشكر أخي سالم النخيش الذي أرسله لي عن طريق صديقي المهندس / عبد العزيز المهيهي ..
الأول : أن الادخار هو سبيل الاستقرار المالي ..
والثاني : أن العمل هو السبيل للثراء ولا شيء غيره ..
كثير من المرات سمعت من يقول .. لا ثراء إلا بورث او نصب واحتيال أو بيع منتجات محرمة .. والحق أن أولئك يتهمون جزافاً ثلاثة أرباع الأثرياء الموجودين في العالم .. كون الكثير منهم وصل للثراء بجد وعمل واجتهاد .. وليس بتجارة محرمة أو ورث ..
وغالب من يرث ورثاً وهو لا كتاب رائع .. أشكر أخي سالم النخيش الذي أرسله لي عن طريق صديقي المهندس / عبد العزيز المهيهي ..
وغالب من يرث ورثاً وهو لا يعرف كيف يتصرف فيه .. يفقده بأسرع مما يتصور .. كون المال مثل أي كائن في الحياة .. إن لم تعرف طريقة للتعامل معه فستفقده بلا شك ..
نحن منذ الصغر .. يعلموننا كيف نجني المال .. لكنهم لم يعلمونا كيف نتصرف مع المال ..
أذكر كيوساكي كم مرة كرر هذه الحقيقة .. في كتاباته ..
سأعود مجدداً لأقرأ النموذج الرباعي للتدفقات المالية .. بمشيئة الله تعالى ..
أما كتاب أغنى رجل في بابل .. فإني أنصح به .. لطيف ورائع ويؤصل لأشياء جميلة في النفس .. I have always found books on personal finance exceptionally boring and have avoided reading them because of this. None of this is new to me however sometimes you need a reminder to jolt you out of bad financial habits. I can highly recommend this and will be buying it a I have always found books on personal finance exceptionally boring and have avoided reading them because of this. I can highly recommend this and will be buying it as a Christmas present for a few people this year. يتحدث الكتاب عن أغنى رجال بابل وأشهرهم أركاد ، إذ يحتوي قصصا تحفيزية عن كيفية تخلص هؤلاء من الفقر والعوز وكيفية استغلالهم للفرص التى سنحت لهم فأصبحوا من خلالها فاحشي الثراء ..
1. ابدأ في ملء محفظتك . يجب ان اقول اننا نميل الي تغيير ارائنا عندما نكون علي صواب بدرجه اكبر مما نغيرها عندما نكون علي خطأ. اذ اننا نتصف بالعناد الشديد عندما نكون مخطئين،وعندما نكون علي صواب نكون عرضه للتردد وترك الفرصه تفر من بين ايدينا. يتناول الكتاب موضوع غاية في الأهمية يتلخص في مجموعة دروس توضح كيف لأي شخص القدرة على إدارة المال وتكوين ثروة بغض النظرعن حجم دخله، مستندًا على مجموعة من الأسس والقواعد التي أثبتت بجدارة فعاليتها حسب الأمثلة المذكورة. الدروس المذكورة ليست بالجديدة، بل يكررها الكاتب بين حين وآخر بأحداث مختلفة، وهي نوعًا ما من المسلمات والتي ينبغي إدراكها بسهولة، لكن تقديم الكاتب لهذه العبر من خلال أسلوب سردي شيق وممتع يجعلها أسهل تفحصًا وفهمًا. 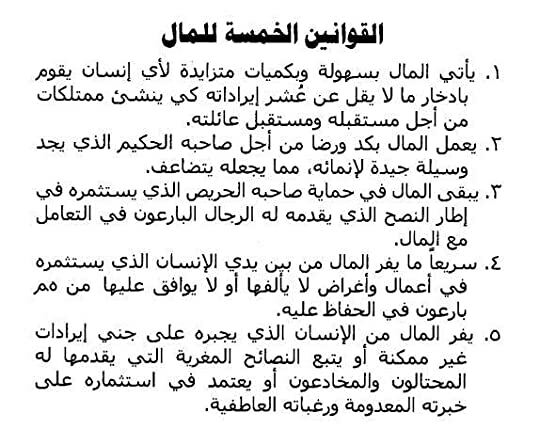 هذا الكتاب الصوتي الأول لي لهذا العام. بلا شك ! الكتاب يحتاج لتطبيع لنضمن فاعليته ..
سوف أحاول تطبيع ما فيه. الكتاب ذو لغة سلسة وسهلة جداً .. وممتعة أيضا ومحفزة بكل ممتاز جداً. George S. Clason published a series of pamphlets beginning in 1926 with financial advice couched in Babylonian parables, which were later combined in book form and given the title, The Richest Man in Babylon. Very basic advice and somewhat dated and repetitious, but I can't help thinking that these 'rules' he put forth should be taught in schools as good advice for beginner's handling money. Our financial advisor gave us two copies of this slim book for our daughters and their husbands and I slipped them into their Christmas stockings this past year. One read it and is following the advice closely, crediting it for their improved financial situation, while the other hasn't yet bothered to read it. George Samuel Clason, also known as George S. Clason. George Samuel Clason was born in Louisiana, Missouri, and died in Napa, California. During his eighty two years he was a soldier, businessman and writer. He served in the United States Army during the Spanish-American War. Clason started two companies, the Clason Map Company of Denver Colorado and the Clason Publishing Company. The Clason Map Com George Samuel Clason, also known as George S. Clason. George Samuel Clason was born in Louisiana, Missouri, and died in Napa, California. George Clason is best known for writing a series of informational pamphlets about being thrifty and how to achieve financial success. He started writing the pamphlets in 1926, using parables that were set in ancient Babylon. Banks and insurance companies began to distribute the parables and the most famous ones were compiled into the book "The Richest Man in Babylon."